Piet Mondrian, 1872—1944: centennial exhibition. New York: Guggenheim Museum, 1971. Chandler A. The aesthetics of Piet Mondrian. New York: MSS Information Corp., 1972. Threlfall T. Piet Mondrian: his life’s work and evolution, 1872 to 1944. New York: Garland Pub., 1988. Deicher S. Piet Mondrian, 1872—1944: structures in space. Köln: Benedikt Taschen, 1995. 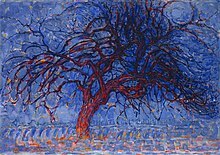 Mondrian: Great Modern Master/ Faerna José María, ed. New York: Harry N.Abrams, 1995. Schapiro M. Mondrian: On the Humanity of Abstract Painting. New York: George Braziller, 1995. Joosten J.J., Welsh R.P. Piet Mondrian: Catalogue Raisonné. New York: Harry N. Abrams, 1998. Bax M. Complete Mondrian. Hampshire: Lund Humphries, 2001. Rembert V. Piet Mondrian in the USA: the artist’s life and work. Dulles: Parkstone Press, 2002. ↑ 1,0 1,1 German National Library, Berlin State Library, Bavarian State Library et al. Record #118583441 // Gemeinsame Normdatei — 2012—2016. ↑ 4,0 4,1 4,2 4,3 4,4 Pieter Cornelis Mondriaan — 2009. ↑ 11,0 11,1 11,2 11,3 11,4 11,5 11,6 11,7 11,8 Мондриан Пит // Большая советская энциклопедия: [в 30 т.] / под ред. А. М. Прохоров — 3-е изд. — М.: Советская энциклопедия, 1969. ↑ Barr A. H. Cubism and Abstract Art — 1936.